One of the amazing things about living in London is the history. It’s something I quite often forget as I dodge tourists while listening to Christmas songs on my iPod (Christmas songs are awesome and can be listened to year round). Every so often you get a reminder. 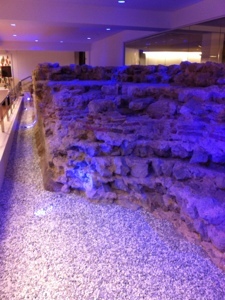 While in a conference centre, walking along a corridor, I came across the foundations of London – The London Wall. Now, yes it is just a pile of bricks with some techno lighting. But it represents hundreds of years of history. Recessions, fires, plagues, wars, the 80’s and London still stands. I am a very lucky girl to live here. Happy Friday! Have a picture of a mouse jumping.